The nominations for the 36th Hong Kong Film Awards are in, and it’s going to drop a few surprises. On Tuesday, nominations for the 36th Hong Kong Film Awards were announced shortly before the start of the 41st Hong Kong International Film Festival. The awards will be held on April 9 at the Hong Kong Cultural Centre. This year, first-time nominees are taking the spotlight, with the likes of Gordon Lam (林家棟), Richie Jen (任賢齊), Shawn Yue (余文樂), and Francis Ng (吳鎮宇) being nominated for Best Actor for the first time in their career. 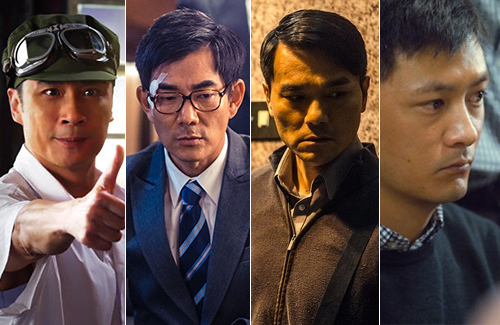 They will be competing against award-winning Tony Leung Ka-fai (梁家輝) for the Film King award. Soul Mate <七月與安生>, directed by Derek Tsang (曾國祥), received a total of 12 nominations, including Best Actress for both Zhou Dongyu (周冬雨) and Sandra Ma (馬思純). Both won Best Actress at 53rd Golden Horse Awards held in Taiwan last November, a first in the ceremony’s history. Zhou Dongyu also won Best Actress at the Hong Kong Film Critics Society Award this year for the same performance. Dongyu and Sandra are grateful for the recognition. Both first-time nominees of HKFA, the Soul Mate stars humbly said they do not expect to win at the HKFA. “I’m already very happy that we got a nomination,” said Dongyu. Check out the list of HKFA nominees below! Is that a pic of Francis as a 19? If so, they needed way more make up. Maybe used CGI like what they did with Chris Evans in the first Captain A movie. He’s a good actor though. Hope he wins. I can’t believe Gordon Lam is on the list. I didn’t like him much back in his TVB days. He was kind of annoying. Had he improve that much since then? Haven’t seen much of him in movies except when in the ones he’s kelefe-like role. @jjwong If nicholas tse can win it 5-6 years ago, why not gordon lam to be nominated? nicholas tse for me his acting more useless lo just that got the look only. Jackie chan his acting more excellent la but never win any. Its about luck also sometimes. But tony leung or francis ng will nail it this time. Leung acting more greatly. Leung still owes TVB a drama, hope he will pay it back very soon! @lam86 i didn’t know Tse won. I agree that he’s not a good actor, nor is he good looking imo. I’m indifferent about Jacky Chan. At least Jacky’s fights/actions are entertaining. He has that talent going for him. Out of that list, Francis is the only one I find legitimately have true acting chop. Gordon at least does put an effort of being good; so kudos on that. I’m rooting for a Jelly – Fish win.